Access to the clean energy along with population growth from one side, and the environmental degradation, climate-change risk, and burden of diseases associated with fossil fuels from other side, force the world to conduct a decent global energy strategy. 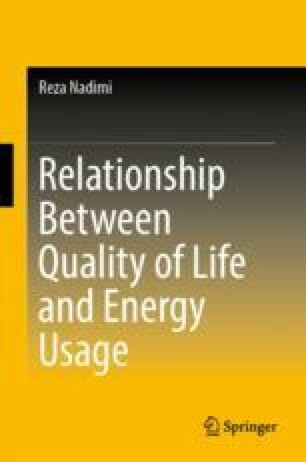 Considering the quality of life approach in the sustainable energy production and consumption brings about defining a decent global energy strategy by maintaining various dimensions of eco-system. . Analysis of countries' quality of life versus energy consumption specifies three global energy policies which support a decent global energy strategy. Eco-sufficiency, eco-efficiency, and energy poverty reduction are three global energy policies that their priorities change in terms of different types of countries. Quality of life analysis against energy consumption proposes three types of countries corresponding with three global energy policies. Developing a global energy strategy in terms of three global energy policies follows the purpose of sustainable development goals, especially sustainable global energy consumption and production. The quality of life indicator must be defined in a manner which not only considers several dimensions of human development, but also mathematically becomes simple and logical. This chapter reviews the concept of sustainable energy consumption and production, human development, and its relationship with sustainable development goals. Stracture of the quality of life indicator and its variables are described in details. Differences between the proposed qulaity of life indicator and other similar indicators are outlined. Then, quality of life indicator and its analysis against energy consumption are carried out in the next chapters. Keywords: Sustainable global energy strategy, Quality of life, Eco-sufficiency, Eco-efficiency, Energy poverty reduction.